The only way to describe the awesomeness of Pitch Perfect is to imagine a super long fun filled Glee, double the fun, double the energy and we get a great comedy/musical. Not only does Pitch Perfect supply us with more fun and the urge to start singing and dancing every 5 minutes. It seems the producers and directors have taken note from Glee! And why shouldn't they Glee is a top quality successful show. You can see where the influence has come from to make this film. Beca (Anna Kendrick) a new chick on the block starting college, would rather lead her life mixing and playing music in LA (with a little help from her father). However she doesn't get onto that path easily, as she is somewhat forced into joining an all-girl A-Capella group. With the repetitive songs throughout the competitions it can get a little annoying. But it contains meaning and foreshadows towards the end. 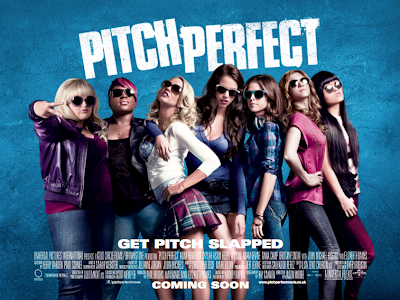 The group contains a variety of girls from a black lesbian and Fat Amy (real name Patricia as we find out). The film contains lots of meaning to youths, it’s a nice upbeat friendly film that will easily have you singing all day. Like in all films there is of course a villian-ish. The competing team is an all-male group who have alter egos and can't be any more in love with themselves. But we see them work together to become a powerful voice which gets the ladies going wild. The film holds a small handful of romance, I would've loved to see more. I sort of felt rushed through Anna’s and Jesse’s romance. But hey romance isn't up to everyone’s taste. Pitch Perfect is just the package that we all know was coming when Glee arrived. At times it seemed more of spoof than a teenage comedy/drama. From time to time it wobbles from safe happy atmosphere to uncomfortable creasing one liners. Overall, it is a good satisfying film for the needs of teenagers who just can't get enough of all singing all dancing action. Danielle Ledington is a young English writer that loves putting her thoughts to paper. She lives in a quiet area of the British countryside.